Update 1: A fix is now in Cydia, called “iBooks Fix”. 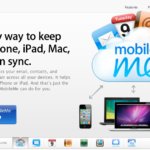 Click here to find out how to install it. This week, Social Apples reports that a change made in the reent Apple iBooks app detects whether an iDevice has been jailbroken, and if so, refused to open content purchased from the iBookstore! Since using the greenpois0n jailbreak, I have been unable to open some of my iBooks that I rightfully purchased from the iBook Store. I thought it was a problem with the downloaded books, so I re-downloaded them. That didnÂ’t work so I removed the iBooks from my iPhone and re-syncÂ’d them from my computer… still no luck. Then I stumbled on a tweet from @comex tonight that really blew my mind. A tweet from @comex seems to clarify the finding which states that whenever a user attempts to open a book downloaded from the iBookstore, the new iBooks attempts to run an unsigned binary to test if the device is jailbroken. If the binary is successful, the device is flagged as jailbroken and the downloaded book fails. There is a problem with the configuration of your iPhone. 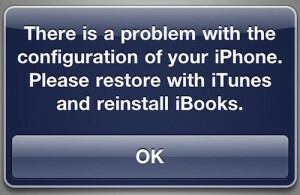 Please restore with iTunes and reinstall iBooks. If followed, restoring the device via iTunes removes the jailbreak, and brings the iDevice back to ‘normal’, within Apple standards. Also, recent updates have indicated that this jailbreak detection has been present since iOS 4.0 and is part of the fairplay DRM check. It has only recently hit the news as new jailbreak methods have opened up Apple’s restrictions just enough to trigger the blocks.